We have a couple kids who have SPD and experience a TON of access energy. They are the crashers, jumpers, movers, shakers, and overall they never seem to run out of energy. I have heard them described as a “bull in a china shop.” If not given things for them to get their energy out they will often make poor choices, bang into objects and people, break things and have little self-control. As time has gone on I have found that when we give them a sensory diet or heavy work activities before seat work/periods of having to sit things turn out MUCH better. Giving them heavy work aka (proprioceptive input) gives input to their muscles and joints, which helps calm, organize, and regulate these kids. Therefore helping them to focus and stay calm by grounding them. This doesn’t only help them at the moment, but it also helps to keep them grounded throughout the entire day. The reason these kids move so much, swing around and crash into things is because they don’t know where their bodies are in space. 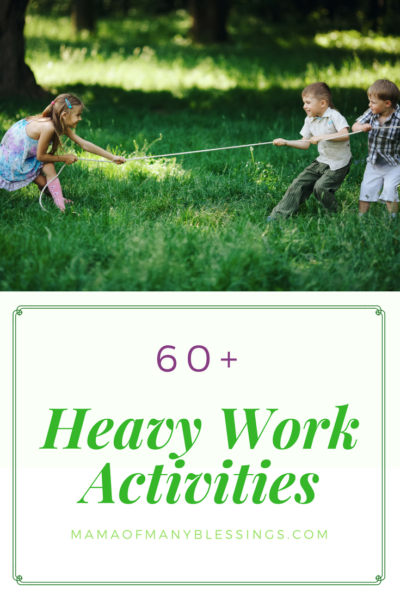 Heavy work activities help give their body awareness and help to ground them. If we don’t provide appropriate activities for these kids, they will seek them out themselves. After 9 years of dealing with this with those multiple kiddos, I have quite a list of resources. I have learned these through lots of trial and error. Some of these ideas worked when we first started our journey do not work for us today. 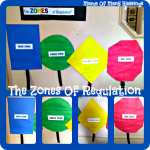 Kids sensory needs change over time. Because of this, watch your child while trying some of these activities to see how it affects their arousal level. Your goal is to help them have the optimal arousal level, to help them function better. You will really be amazed at how much easier it is for these kids to sit still during seated work or activities after you find activities that help to calm them. So, today I am sharing some of the really great heavy work activities that have been useful to us over the years. Pushing or pulling a stroller, wagon, shopping cart, etc… Since going out in public can be so difficult for SPD kids these are some great ideas to get them through the trip. There were times we would bring along our little shopping cart, and our kiddo would push it through the store with us. 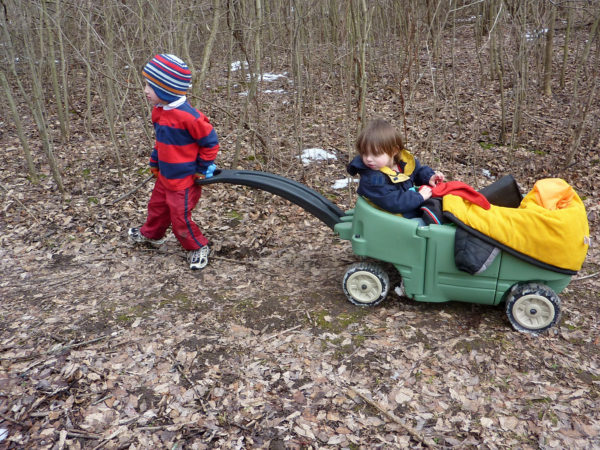 When we would go on walks or nature exploring I would have them pull the wagon or push the stroller. Dig in Dirt. 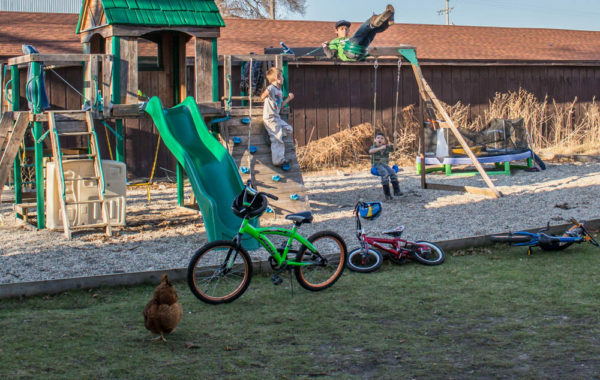 – We have made a designated area for the kids to be able to dig in other than our sandbox. 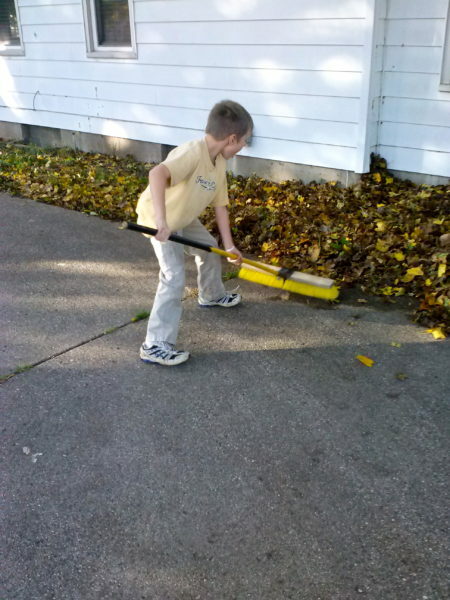 Pushing a broom or shovel – Having them push a broom or shovel has always been great heavy work activities. Now I will find Ethan outside using the broom to push around leaves, dirt, or even puddles or he will look for the shovel to shovel snow without me even asking him to. He knows it helps him feel better. As he gets older he has begun to realize when he needs to seek these activities out. Push A Wheelbarrow. – Use a regular size or child size wheelbarrow. Have them help with yard work, or find them things to push around things in the wheelbarrow. Carry or Push Laundry Basket. – Have your child help carry laundry baskets full of clothes, or put blankets in them. They can also push them around the house. 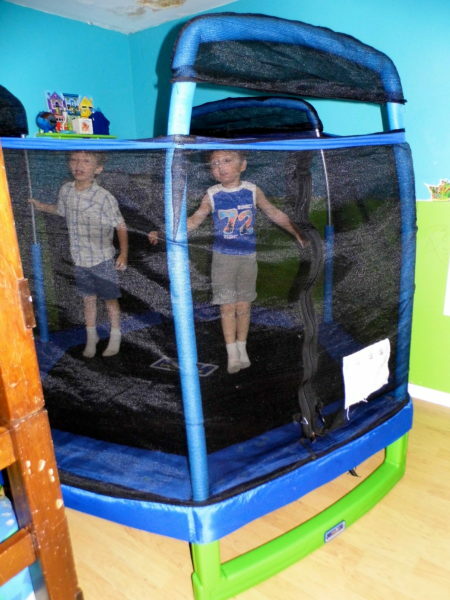 Jump On A Trampoline – When it is cold outside we will have a smaller indoor trampoline for the kids to jump on. When it is warmer outside the kids can use our outdoor trampoline. For a while, Ethan could NOT go on a trampoline. It would rev him up really bad and cause a TON of problems. As he has gotten older, he can now use the trampoline as long as he is reminded to listen to his body and take breaks as needed to calm down. Rip Up Paper or Cardboard. – Use junk mail, empty cereal boxes, scrap paper and let your child rip them up into pieces. Play In The Sand – Playing in the sand is such a great heavy work activity. Either at the beach, in a sandbox, or a sand sensory bin. When kids play in the sand, digging, filling trucks with sand, it is such great input. Find Buried Treasure. 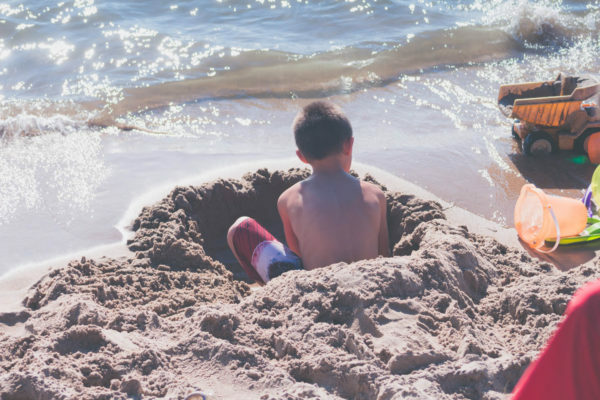 – Durry treasure in a sand bin or sandbox and have the child dig for lucky coins. Make Moon Sand. – It is super easy and inexpensive to make. Washing Windows or Tables – Having kids help with housework is a great heavy work activity. They can wash windows, scrub floors, wash the table or counters. Pouring Items. – Dry beans, water, rice etc. Pouring them back and forth from container to container. 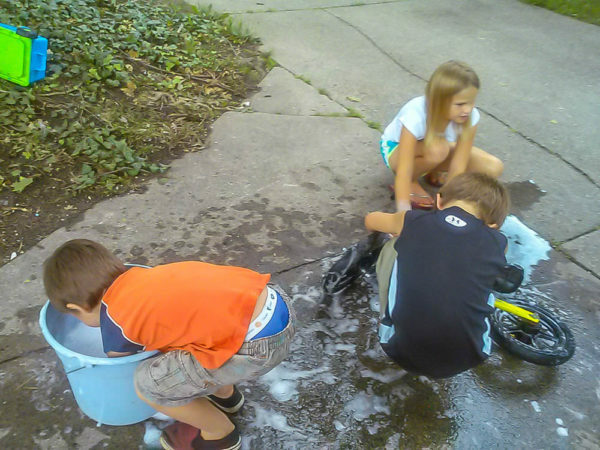 Washing the Car or Bikes – Having kids help wash the car or even their bikes are not only a way to keep them busy, but a perfect heavy work activity. It will also help keep them cool on a hot day. Push Ups. – DO them either against the wall or on the floor. Jump and Crash. – Jump and crash into a mattress, bean bag, or a crash pad. 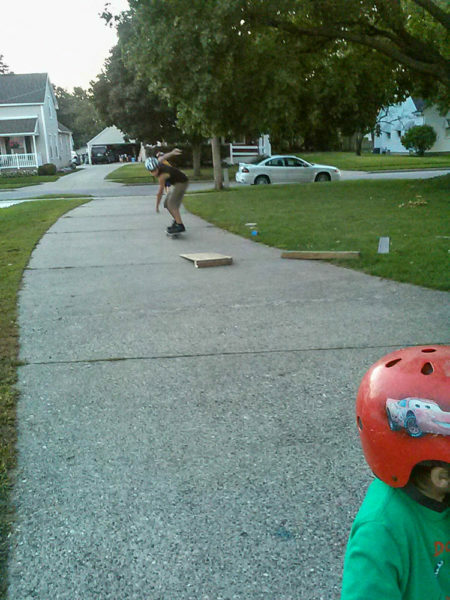 Skateboarding, Riding Bikes or scooters – My kids love to get out and ride their bikes, scooters, or skateboards to get their energy out. Carry A Pile Of Books. March in Place While Stomping. Swinging on swings, hammocks, disc seat, etc… – Getting on a swing and pumping their feet to get higher and higher is great input. As long as they don’t have a gravitational insecurity. For many years swings were not something Ethan would get anywhere near due to the gravitational insecurity. Playing on a playset in itself is such great input for them in general. The climbing, jumping, sliding, is perfect for them. 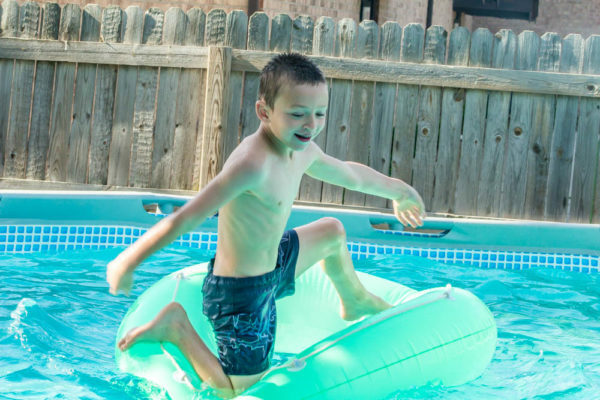 Swimming – This has to be one of the absolute best ways to get heavy work in for kids. When our pool is open our SPD kiddos struggle so much less. They really don’t want to get out of it. We purchased a YMCA membership so during the winter months they can still get the input from the water. Making Flubber or Slime – Making your own flubber or slime is such a great heavy work activity. It’s pretty simple to make on your own too. You can make it with borax for a more Gack type slime, or use liquid starch for a more liquidy type of slime. Most of them will last for a while in a sealed container. Pass The Animal. – Play pass the stuffed animal with a weighted stuffed animal. Dry Erase Board. – Have your child write on and wipe off of a dry erase board. 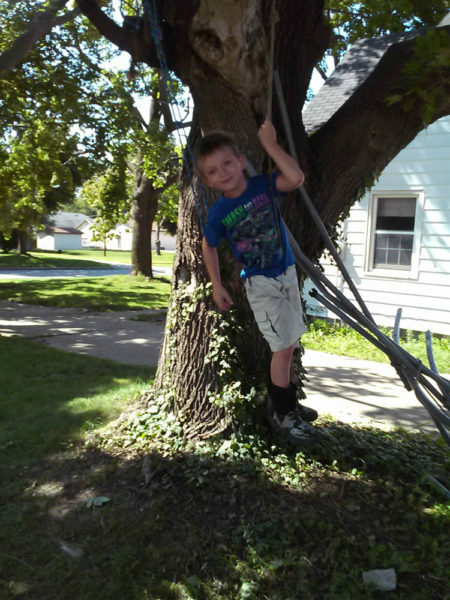 Climbing Trees – Now I have to admit I often have to look away when my boys are climbing trees, and pray that God has them in his hands. It will keep them busy for hours and give them such great input it is a perfect activity. Paper Basketball. – Crumple paper and toss it into the trash can. Obstacle Course. 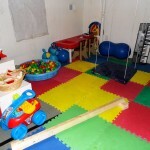 – You or your child can create an obstacle course for your child to go through. 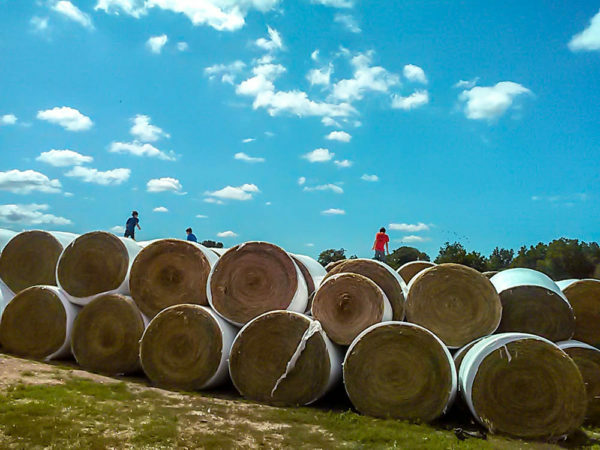 Playing On Hay Bales – Now I realize that not everyone has the opportunity to let their kids play on hay bales, but if you do it is such a perfect heavy work activity for kids. They run, jump, climb, and have a really great time. We are friends with a local farmer who doesn’t mind the kids playing on the hay bales at all. They could spend the whole day playing on them. Bubble Wrap Popping. – Have your child either use their hands or feet to pop bubble wrap. Hop Ball. – Hop around on a hop ball. 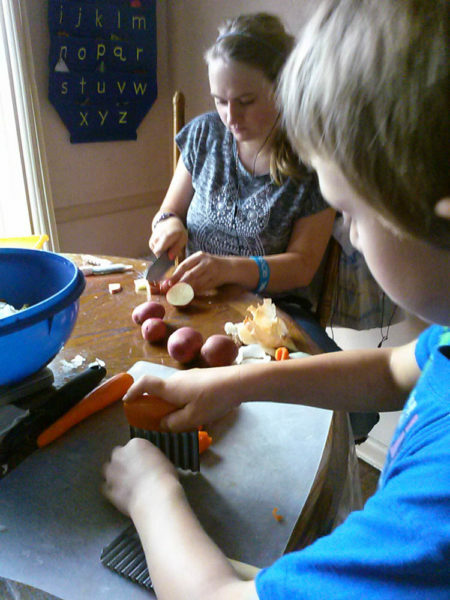 Helping In The Kitchen – Having kids help in the kitchen is great for kids in so many different ways. 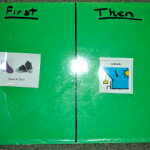 It helps to build their self-confidence, builds great fine motor skills, and is a great heavy work activity. Hole Punch Paper. – Have your child use a hole or shape puncher on paper. 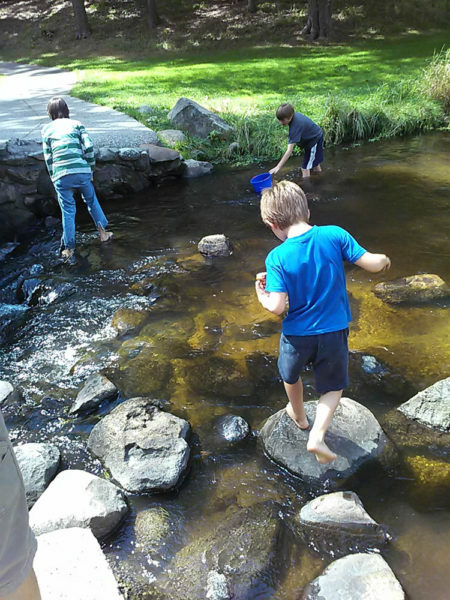 Jumping Rocks In A Creek – Find a local creek and have the kids jump from rock to rock. Chances are your kids will spend hours doing this and might get a little wet in the process. Pretend Paint. – Give your child a paint roller and have them pretend to paint the wall or cupboards. Blow Pom Poms. – Blow pom poms with a straw across the floor or table. Playing With PlayDough. 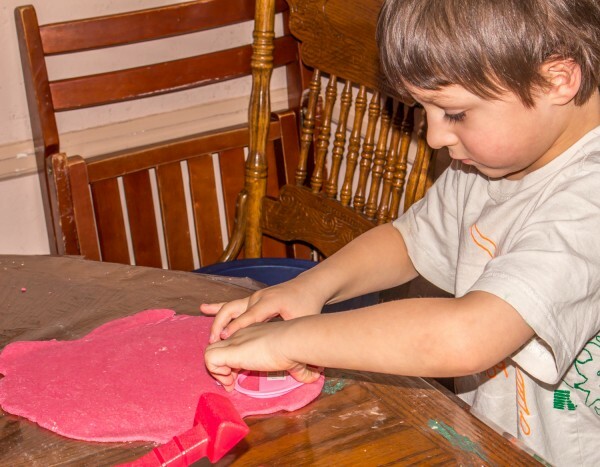 – Rolling, smashing, pushing down, and cutting play dough is a great heavy work activity. 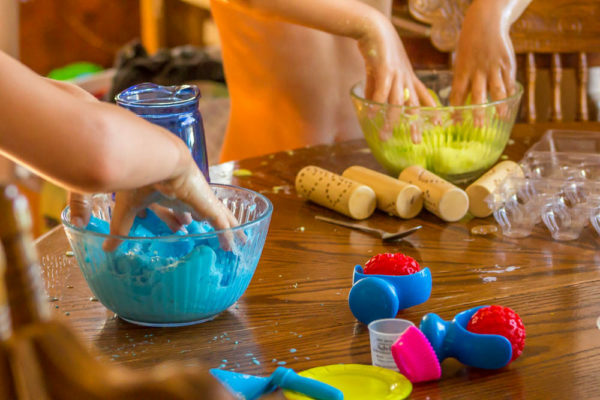 It is simple enough to make your own batch of playdough. If you add a little vegetable glycerin to your playdough will make is super soft. Oh, and you can even add some scents to it to add some fun to it. Eating Crunchy Food. – Carrots, popcorn, celery, etc… Anything that is crunchy is great. Animal or Wheelbarrow Walks. – Do a crab walk or wheelbarrow walk. Playing Outside. – Incorporating lots of jumping and running. Summersaults – Do some summersaults on the grass or dirt outside, or in the house on your carpet. Push Trucks. – Pushing large trucks or cars is great input. Carrying Heavy Items. – Wash out old milk or water jugs and let them dry out. Once dry fill with sand, beans, rice. Have the child carry them around. Jump onto Cushions or Pillows. Child “sandwich.” – Put the child in between 2 couch cushions or pillows and gently smoosh them. Scooterboard. – Have your child scoot around on a scooter board on their stomach. Peanut Ball Roll. – Use a big peanut ball and roll it back and forth on the child. Play Catch. – Use a ball or bean bags. Tug Of War. – Play a game of tug of war. 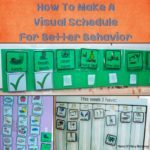 Many of these ideas have been so great for us to use. While some of them work during a certain time, others don’t work as well. If we try them later they might work great and they might not. 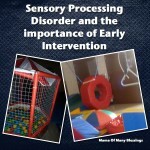 It’s amazing how your child and their sensory need change over time. 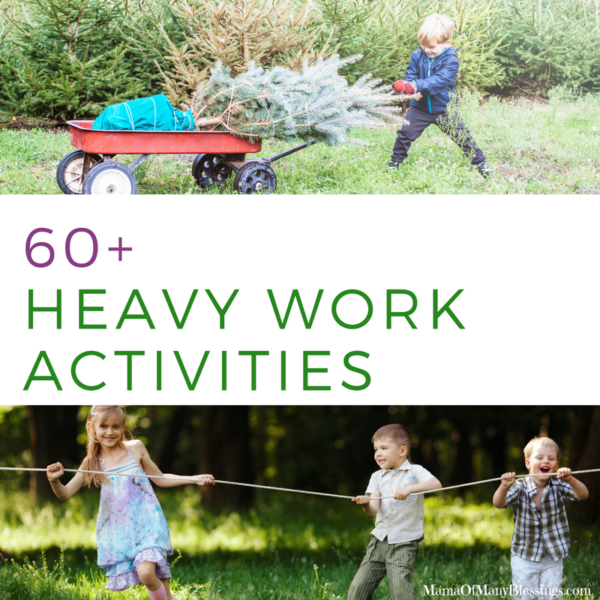 What is your favorite heavy Work Activity for kids?? Leave a comment below and let me know, I would love to hear from you!! 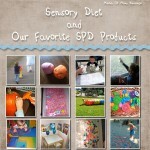 They all have a TON of great ideas for parents looking for heavy works and other sensory diet activities. 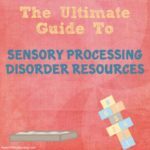 Any of them will be such a great resource for parents looking to understand sensory issues or ways to implement a sensory diet. Here are a few of our favorites. 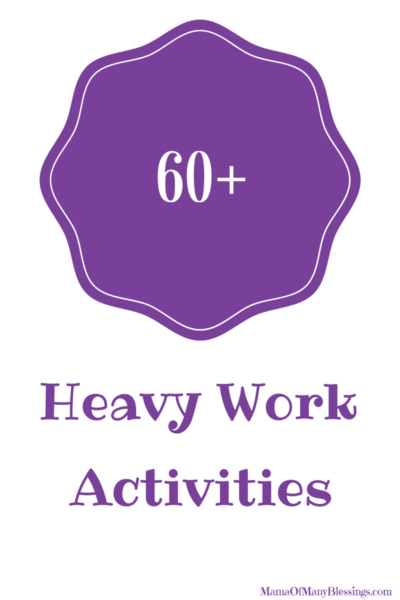 Looking for more heavy work, SPD, Autism, and more special needs posts? 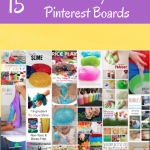 Head over to my Special needs Pinterest board for more great ideas!! I may be linked up with any of these great linky parties.